Listening to: Dynamite Steps - The Twilight Singers (2011). I've been meaning for a while now to post some of the favourite aircraft photographs I have taken over the last twenty years or so, and talk about the background behind them and why I like them. It was originally going to be a top 10, but I couldn't decide on 10, so it will more likely be an occasional thing. A post at Adventures in the Underground about another blogger's blue theme photo contest seems a good way to kick the series off. 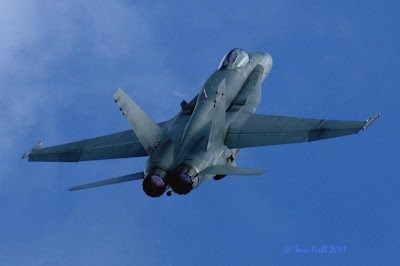 It is an Australian FA/18 showing off at the RNZAF Whenuapai Open Day in 2009, launching into the sky just after take off, undercarriage still retracting, tail-planes well deflected for the climb, full afterburner (and full noise) and moodily underlit due to the patchy cloud that day. I like it because it evokes the power and agility of aircraft like this, and the way they can seem to bludgeon gravity into submission by sheer performance. I also like it because it is a decent snap of an aircraft not seen in NZ too often, and because it was the start of one of the best combat aircraft displays I have ever seen. It was a cool moment. Very nice! Matt likes it, too! Wow! That's a fantastic shot!! Love it!